President Trump has ordered the FBI to conduct a "supplemental investigation" to update Supreme Court nominee Brett Kavanaugh's file, the president announced in a statement released Friday by White House press secretary Sarah Huckabee Sanders. The order comes after crucial swing vote Sen. Jeff Flake, R-Arizona, called for an up to one-week delay in the Kavanaugh confirmation vote in order for the FBI to conduct an investigation. Other key senators soon backed him up. After GOP senators huddled on Capitol Hill, the Senate Judiciary Committee announced it was asking the White House for an FBI probe. That request was swiftly granted. "I've ordered the FBI to conduct a supplemental investigation to update Judge Kavanaugh's file. As the Senate has requested, this update must be limited in scope and completed in less than one week," the president's statement reads. The last 24 hours have been a whirlwind. On Thursday, after Kavanaugh and his accuser, Christine Blasey Ford, offered their emotional, riveting testimony on Capitol Hill Thursday, Kavanaugh's confirmation seemed more likely than not. Ford insisted she was "100 percent" sure Kavanaugh assaulted her when they were both in high school, and Kavanaugh insisted he was completely innocent. Republicans voiced their support, and Democrats opposed the nominee. Then, Flake threw a wrench in Republicans' plans. On Friday morning, Flake issued a statement saying he would support Kavanaugh's confirmation, emboldening Republicans. But then, Friday afternoon as the Senate Judiciary Committee was set to vote, Flake said he wanted to delay the Senate floor vote for up to a week so the FBI can investigate. Sen. Lisa Murkowski, R-Alaska, another key GOP vote who hasn't announced where she stands on Kavanaugh, also voiced support for Flake's proposal, as did Sen. Joe Manchin, D-West Virginia. Kavanaugh advanced from the committee with an 11-8 vote, but if Kavanaugh lacks votes on the floor, Republican leadership doesn't want to push a vote too soon. As Mr. Trump ordered the FBI supplemental investigation, Kavanaugh, through the White House, said he "will continue to cooperate." Debra Katz, one of Ford's attorneys, said an FBI investigation is "critical to developing all the relevant facts." "A thorough FBI investigation is critical to developing all the relevant facts. Dr. Christine Blasey Ford welcomes this step in the process, and appreciates the efforts of Senators Flake, Murkowski, Manchin and Collins -- and all other senators who have supported an FBI investigation -- to ensure it is completed before the Senate votes on Judge Kavanaugh's nomination," Katz said. "No artificial limits as to time or scope should be imposed on this investigation." Republican leadership has agreed to a request made by Sen. Jeff Flake to delay a floor vote on Supreme Court nominee Brett Kavanaugh up to one week so the FBI can review sexual misconduct allegations against Kavanaugh. President Trump — who would have to request such an FBI probe — said moments earlier than he would defer to the Senate and whatever Senate Judiciary Committee Chuck Grassley wants to do. Grassley announced that the committee will "request the administration to instruct the FBI to conduct a supplemental background investigation." "The supplemental FBI background investigation would be limited to current credible allegations against the nominee and must be completed no later than one week from today," the statement from the committee reads. President Trump, seated with Chile's president, was asked for his response to Flake's request. Mr. Trump said he's leaving everything up to the Senate. "I'm gonna rely on all of the people, including Senator Grassley, who's doing a very good job," Mr. Trump said "That'll be a decision that they're going to make, and I suspect they'll be making some decision soon, whether to take a vote or to do whatever else they want to do. I will be totally reliant on what Senator Grassley and the group decides to do." The president added that he found Ford to be a "credible" witness," and called her a "fine" woman. Grassley concluded the meeting by invoking the "two-hour rule," which elicited a shocked and frustrated response from Sen. Dianne Feinstein, the ranking Democrat on the committee. So, what is the two-hour rule? Buried in the Senate rules, the "two-hour-rule" or Senate Rule XXVI, restricts the times that most committees can meet when the Senate is in session. It's aimed to help balance the committee's work and logistics — but of course, can also be used the convenience of a committee chairman. Despite Flake's request, the committee — with Flake's support — approved Kavanaugh's nomination to move along to the full Senate. Flake, after speaking with senators outside the hearing and delaying an afternoon Senate Judiciary Committee vote, threw a wrench in Republicans' plans when he called for a "delay" on the floor vote in order to allow the FBI to investigate the allegations. It's unclear exactly what happens next, as Kavanaugh has the votes in committee to pass. The Senate Judiciary Committee voted to move its vote on Kavanaugh's confirmation until 1:30 p.m. on Friday. Several Democrats left the room while Republicans spoke afterwards. Democratic Sens. Cory Booker of New Jersey, Kamala Harris of California, Richard Blumenthal of Connecticut, Sheldon Whitehouse of Rhode Island, and Mazie Hirono of Hawaii talked to reporters outside the hearing room and accused the majority of ramming through Kavanaugh's nomination, and they continued to insist that the FBI investigate the allegations against Kavanaugh. Speaking before the committee, Republican Sen. Lindsey Graham -- a staunch Kavanaugh supporter -- reasserted his support for the judge and his condemnation of his Democratic colleagues. "I'm a single white male from South Carolina, and I'm told I should just shut up, but I will not shut up," Graham said. He also fired a warning shot to Democrats. "If I am chairman next year ... I'm going to remember this. There's the process before Kavanaugh, and the process after Kavanaugh." Meanwhile, protesters confronted Flake in front of the Senate elevators, preventing him from leaving for several minutes. "You're telling all women that they don't matter, that they should just stay quiet, because if they tell you what happened to them, you're going to ignore them," a protester said, as Flake looks down. 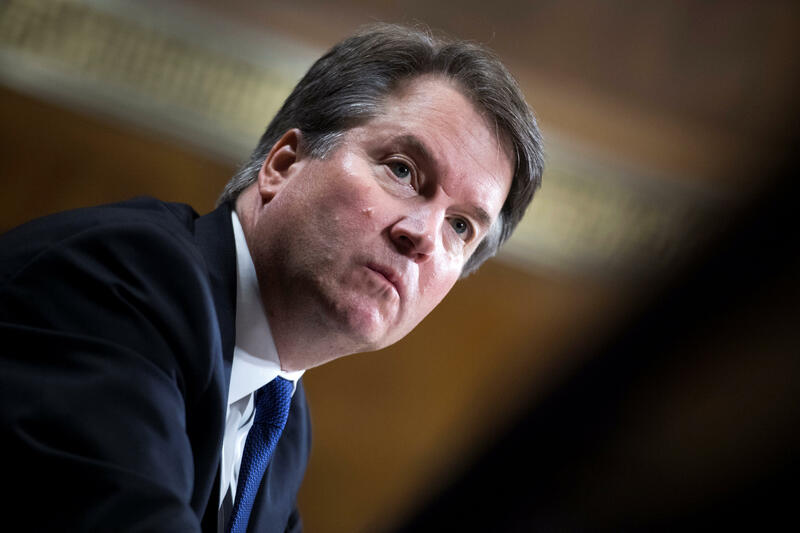 The American Bar Association has urged the Senate Judiciary Committee and the full Senate to slow down the confirmation process for President Trump's Supreme Court pick, Judge Brett Kavanaugh, until the FBI has time to do a full background check on the claims made by Ford and other women. During hours of emotional testimony before the committee Thursday, Kavanaugh vehemently denied ever having sexually assaulted Ford or anyone else, and cited as evidence his multiple background checks and clearances by the ABA during various stages of his career at the highest level of the U.S. judiciary system. Sarah Sanders, speaking to reporters Friday morning, said she thinks "all of America" though Ford's testimony was compelling, although she wouldn't specifically say whether Mr. Trump thought her testimony was compelling. Sanders said Ford was wronged by someone, "but not at the hands of Judge Kavanaugh." Sanders also blasted how Democrats handled the allegation against Kavanaugh initially. Top White House officials took to television Friday morning to defend Kavanaugh and urge his swift confirmation to the highest court. Kellyanne Conway, appearing on "CBS This Morning," was pressed how Kavanaugh could be a neutral figure on the court when he berated the accusations against him as political. Conway claimed that once Kavanaugh is on the court, "he will call the balls and strikes" fairly, as he has for more than a decade. Conway said she did find Ford "very compelling and very sympathetic," adding that she believes Ford "was wronged by somebody." But Kavanaugh, she said, was not that somebody.